Renewed strength in the Upper Midwest would be great news for Democrats. With Democrats having won the House but not the Senate on Tuesday — and with President Trump still in the White House — we’re headed for two years of divided government. That doesn’t mean there won’t be news, like … oh, say, the president firing the attorney general the day after the election. But it does mean that pretty much every political battle is going to be pitched with an eye toward 2020. And 2020 will be a unique year in that the House, Senate and presidency are all potentially in play.1 How the presidency goes is anybody’s guess. But Trump took advantage of the Electoral College last time around, winning the tipping-point state (Wisconsin) by about 1 percentage point even though he lost the popular vote by 2 percentage points. If Trump has the same edge in 2020, that could go a long way toward winning him a second term. The thing is, though, that the Electoral College advantage is historically pretty ephemeral. Relatively subtle changes in political conditions can make the Electoral College go from helping you to hurting you. In 2008 and 2012, for example, the Electoral College worked toward Democrats’ benefit, as Barack Obama would likely have won it in the event of a popular vote tie. So here’s some slightly scary news for Trump: The 2018 map looked more like 2012 than 2016, with Democrats performing quite well in Wisconsin, Michigan and Pennsylvania, the three states that essentially won Trump the election two years ago. 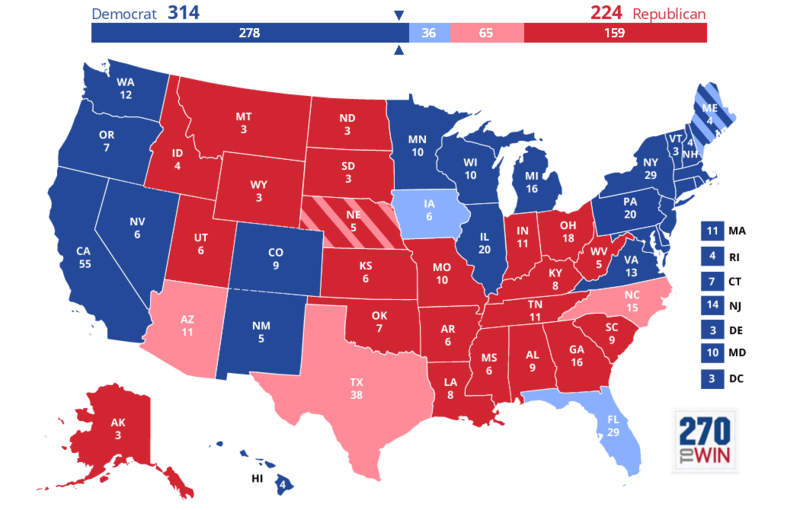 With those caveats aside, here’s the map you come up with if you count up the popular vote. It ought to look familiar. 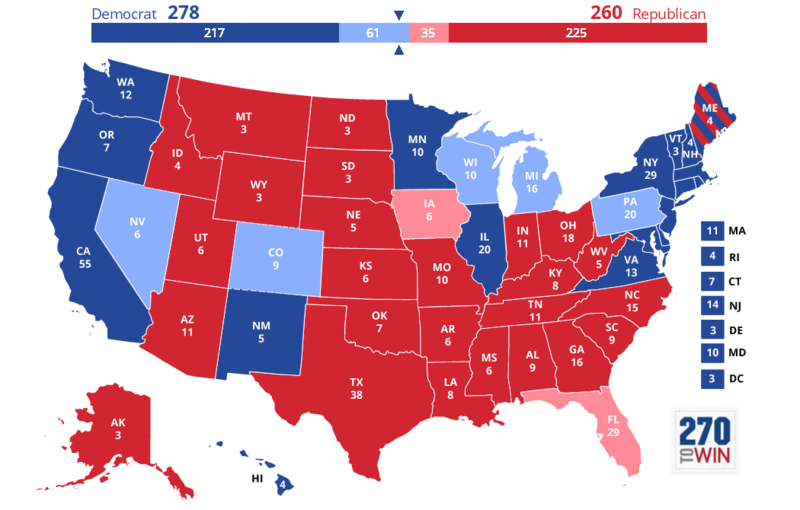 In fact, it’s the same exact map by which Obama defeated Mitt Romney in 2012, except with Ohio going to Republicans. It would have equated to 314 electoral votes for Democrats and 224 for the GOP. States shaded in light blue were won by Democrats, but by fewer than 5 percentage points. So it’s noteworthy which states are not in light blue but are solid blue instead. Democrats won the popular vote in Michigan by 7 percentage points, in Wisconsin by 8 points, in Pennsylvania by 10 points, and in Minnesota by 11 points. In other parts of the country, they won Nevada and Colorado by 6 points each, New Hampshire by 12, Virginia by 15 and New Mexico by 19. The pink states — where Republicans won by fewer than 5 percentage points — are also interesting, mostly because they include Texas, where Democrats lost the popular vote for the House by only 3.6 percentage points and Democrat Beto O’Rourke lost his race for the Senate by just 2.6 points. It’s not as though Texas is exactly at the tipping point yet: Democrats came close to winning it, but they didn’t get over the top, even in a pretty blue year. But it probably deserves to be included in a group of Sun Belt states with North Carolina, Arizona and perhaps Georgia (where Democrats lost the popular vote by 6 points) as places where Democrats can compete in a good year. Among these, Arizona was the best one for Democrats on Tuesday night; they currently trail in the popular vote for the House there by 1.7 points and could make up further ground, as a lot of ballots from Maricopa County are still left to be counted. In less favorable developments for Democrats, they had very disappointing results in Ohio, where they lost the gubernatorial race and where their candidates lost the popular vote for the House by 5.5 percentage points. Ohio hasn’t gone the way of Missouri yet, where Democratic congressional candidates lost by 13 points on Tuesday night, but it may be getting there. This is certainly not a great map for Democrats, but it’s not a bad one either. There are 217 solid Democratic electoral votes on this map, as compared to 225 solid Republican ones; the other 96 are tightly contested, but Democrats trail in Florida while narrowly leading in Wisconsin, Michigan and Pennsylvania. If 2020 were contested on this basis, you wouldn’t say that either side had a clear Electoral College advantage. What is clear, though, is the importance of Pennsylvania, Wisconsin and Michigan (although you could also add Minnesota to the mix). Win all three of them — let’s call them the Northern Path — and Democrats don’t need Florida, assuming that they hold the other states. Lose all three, and even Florida wouldn’t be enough. Instead, they’d have to win Florida plus at least one of North Carolina, Arizona, Texas and Georgia as part of what you might call a Sun Belt Strategy. Hillary Clinton’s problem was that Trump performed well in the Northern Path states — and she didn’t campaign in them enough — but at the same time, the Sun Belt Strategy wasn’t really ripe yet. She did much better than a typical Democratic candidate in Arizona and Texas, but not well enough to actually pull off wins there. Getting stuck in between the Northern Path and the Sun Belt Strategy is a big risk for Democrats: where their Electoral College problems become most acute. And although the potential addition of Texas to the Sun Belt Strategy group of states makes it more intriguing, Tuesday night’s results suggest that the Northern Path is still the path of least resistance for a Democrat hoping to win the Electoral College. If Trump has lost the benefit of the doubt from voters in Pennsylvania, Wisconsin and Michigan, he may not have so much of an Electoral College advantage in 2020. Democrats won uncontested races in Florida’s 10th, 14th, 21st and 24th congressional districts. Based on the results from uncontested congressional districts in states other than Florida on Tuesday night, I estimate that each one would have given Democrats about 180,000 votes if they’d been counted.